Obituary – Danuser, May Cornelius (Albin) « Perry High School Alumni Association, Inc.
May Danuser was born June 7, 1900, in Noble Co., Oklahoma Territory. 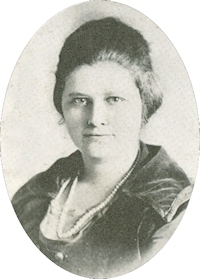 She was the second of seven children born to Ellsworth & Effie Belle Albin (4 daughters, 3 sons). After graduating from Perry High School in 1921 she married Walter Danuser on December 19, 1921 in Enid, Oklahoma. They had two children; Dorothy Fay (Danuser) Beckett (1923 – 2015) and Jack Ellsworth Danuser, Sr. (1926 – 2006). Walter preceded her in death in 1984. May died on March 2, 1996 in Stillwater, Oklahoma and is buried at the Sunset Memorial Gardens.